Italian Prune Plums, just a small portion of my 3 pound Costco purchase. I bought three pounds of fresh prunes. I’ve never bought a single fresh prune, let alone three pounds of them. At Costco, among the pallets of 50-pound bags of dog food and cases of toilet paper bigger than my bathroom, three pounds of prunes and $7 purchases seem like nothing … until the cashier tells me the total sum of all my “little” purchases and I try to find room in my crisper, already filled with a 10-pound bag of organic carrots, for the case of prunes. Technically, I think they are plums, Italian Prune Plums. They taste and look a lot like plums, just a little more tart. Jackson and I enjoyed snacking on them fresh out of the over-stuffed crisper drawer for awhile. 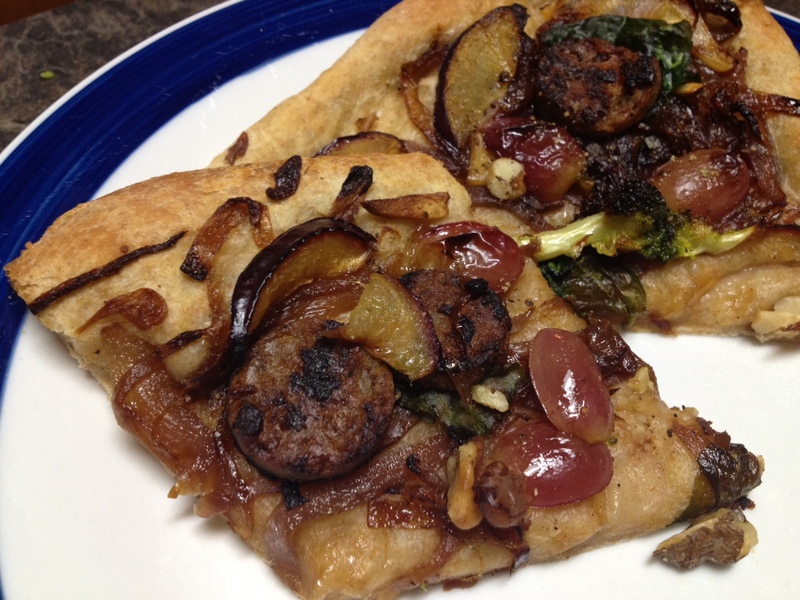 I put them on a pizza, with caramalized onions, vegan applewood sausage, walnuts, spinach, broccoli, and grapes. Prune pizza, who knew it would taste like a little slice of sweet and savory heaven? One night, I chopped them up and threw them in pot on the stove while I heated up some of another impulse Costco purchase, a huge box of spring rolls. Can you see I have a problem? Anyway, the prune plums reduced into this gorgeous sweet red sauce. With a dash of spicy chili paste, it made the perfect dip for a spring roll. Though I could eat egg rolls and pizza every night, I probably shouldn’t. So, I needed a recipe that would really make a dent in my prune inventory without putting unsightly dents on my thighs. 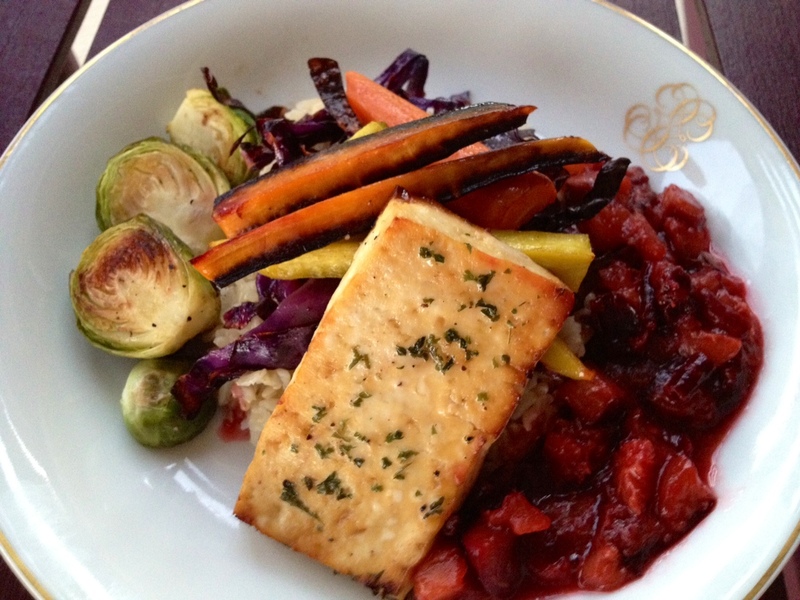 Last night, I made the prune plum sauce again and served it with buttery roasted vegetables and tofu over brown rice. All the flavors were rich and deep and the colors were so beautiful. I’m almost out of prunes now and I’m tempted to buy three more pounds. All the ingredients people love to hate–prunes, brusel sprouts, tofu, and cabbage–in one glorious dish that proves those haters wrong. 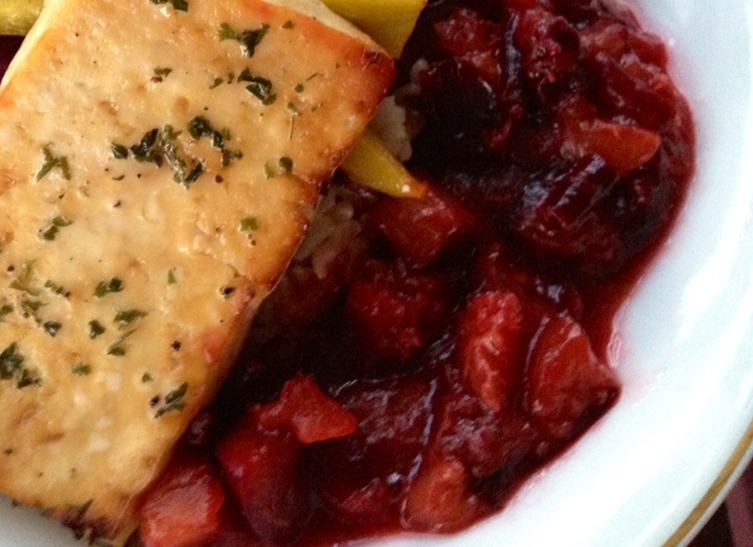 Coat veggies and tofu with sweet and salty buttery blend. Preheat oven to 400. (My oven has a convection roast setting that works nicely for this, but you certainly don’t need it). 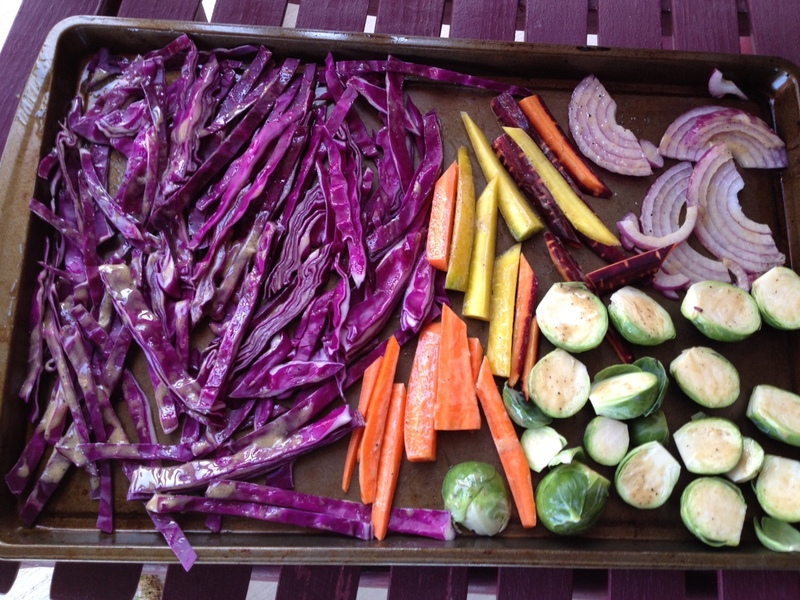 Spray a cookie sheet with nonstick cooking spray and spread out sliced veggies and tofu. Mix butter, oil, Bragg’s, agave, salt and pepper, and use a pastry brush to lightly coat the veggies and tofu. 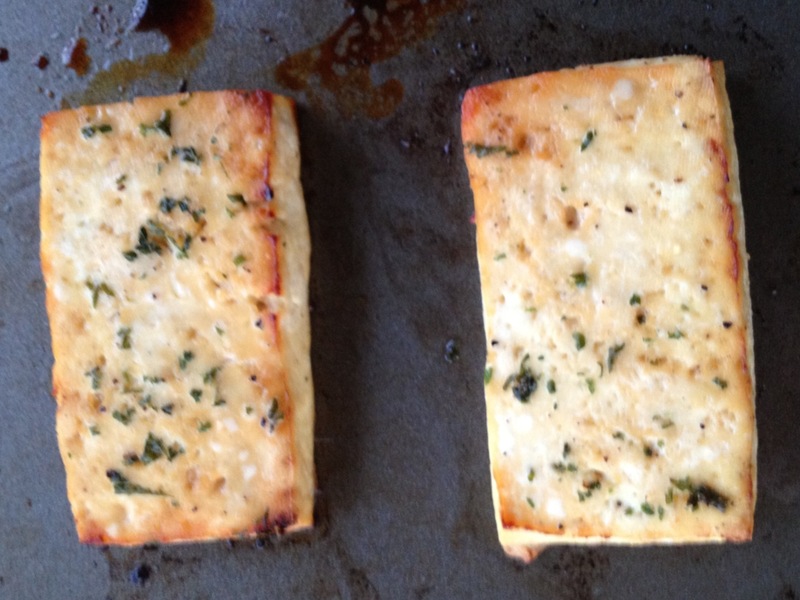 Drizzle tofu with a little extra agave and a pinch of parsley for color. Cook vegetables and tofu, stirring veggies after about 10 minutes. 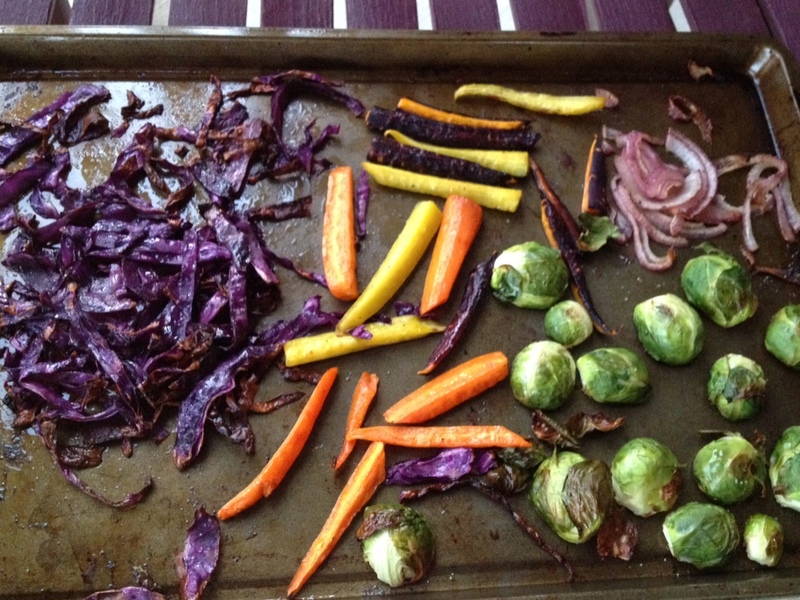 Roast until the carrots, onions, and cabbage are soft and the Brussel sprouts are golden brown, 20-30 minutes total. Buttery, flaky, and moist tofu reminded me of baked fish. 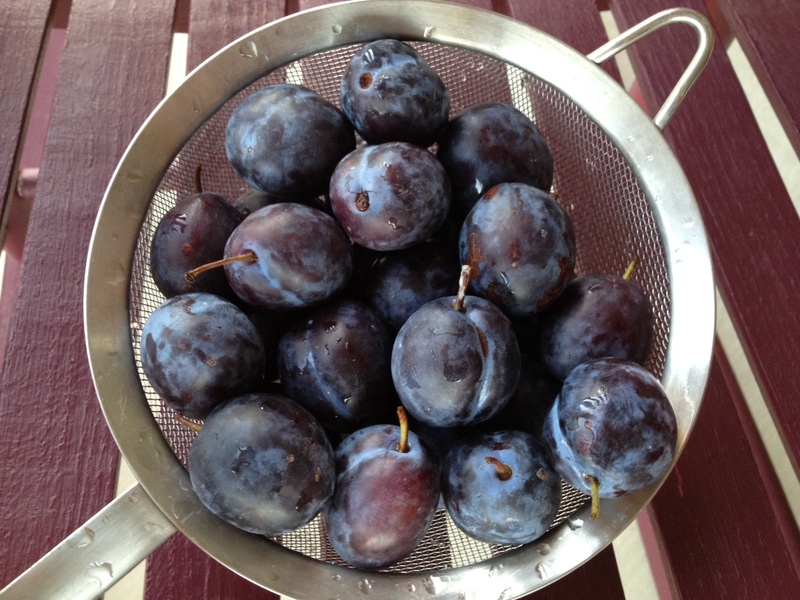 Chop up plums into small dices. 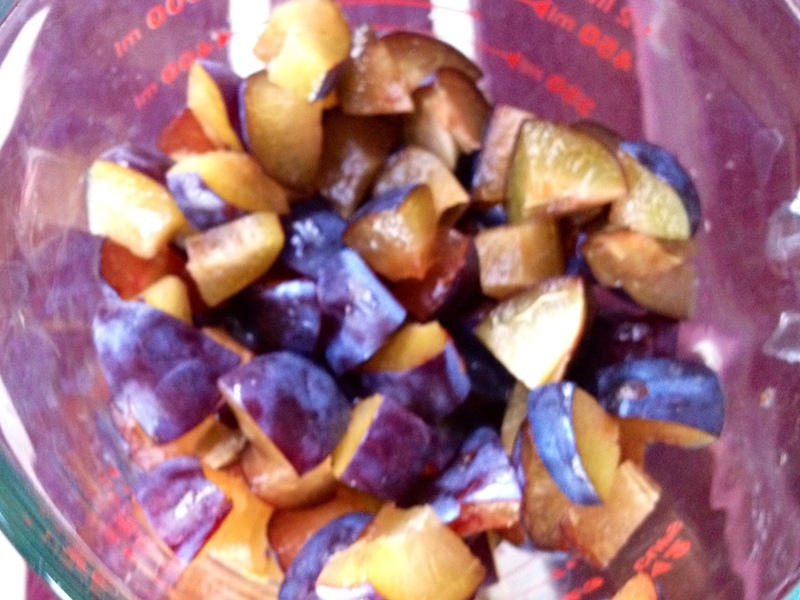 Chop plums into small dices, heat on medium heat for five minutes, stirring often. Add agave, chili paste, and salt. Continue to cook and stir for about five more minutes or until the plums turn into a beautiful red chunky sauce. Delicious with a bite of buttery flaky tofu or with fried spring rolls. Sweet and spicy, this plum sauce was the star of the plate. please tell me how to print just the recipe, not the whole blog. Vicki, we’ve discovered the only way to get the “print recipe” feature is to switch to another blog host. It is in our plans to do this right after we finish our book in mid-November, which is all consuming right now. For now, the easiest way is to highlight the recipe only, then use your cut and paste feature to put it on a blank word doc and print. A bit of trouble, no doubt! We appreciate your patience!